Talks on Education in Town: A Note about China and U.S. In the evening of September 7, a talk on the Chinese economy, "Rethinking China: Why Conventional Economic Wisdom is Wrong?" took an interesting spotlight on education. The talk, the first of the "Rethinking China" series launched this Fall by China Institute's Center for Business, invited Dr. Yukon Huang, former World Bank China director and currently with the Carnegie Endowment, to present and discuss some controversial points in his new book, "Cracking the China Conundrum: Why Conventional Economic Wisdom is Wrong." 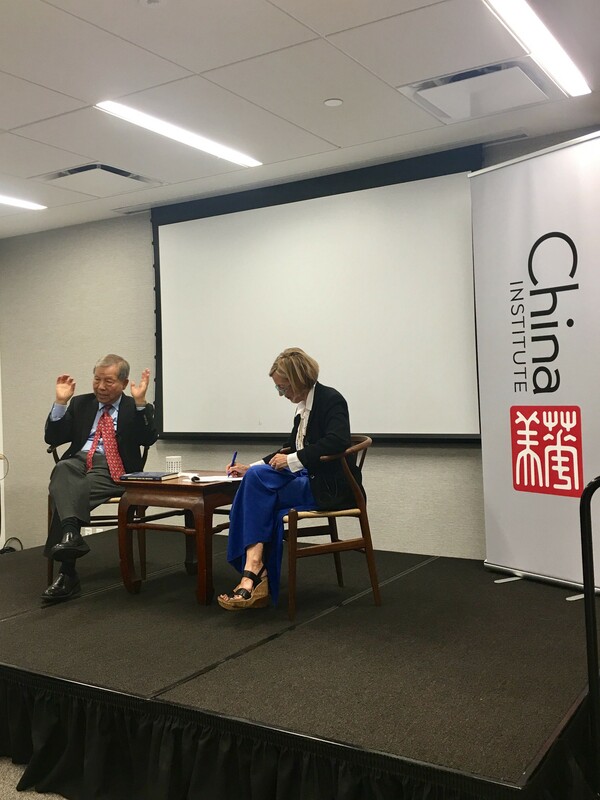 Huang convincingly delivered his points opposite to what he calls "conventional economic wisdom" on a wide range of topics including China's growth and debt prospects, U.S. - China trade tensions, U.S. and E.U. foreign investment in China, role of corruption and political liberalization in China, etc. For example, on contrary to the common perception that corruptions slow down China's economy, Huang argued that in fact, in a country like China where government, banks, and state owned enterprises are all under one Party's control, corruptions cross sectors are the reason China's government and private sectors can function so efficiently to fuel its economic miracle growth. To get a nuanced understanding of his intriguing points on all topics, as Huang put it with a great sense of humor, one has to buy his new book, which, BTW, was sold out right after the event. Over fifty American, Chinese and European audiences were packed in the lecture room that evening. Most of them were from business sectors, with a sprinkle of educators. "If there is one perception that you want Americans to change after reading your book, what that would be?" Without much hesitance, Huang responded, "People should have more confidence in American culture, and how deeply Chinese people appreciate American values. Despite the economic growth, Chinese people from all social spectrums send their Children to the U.S. for schooling, including President Xi Jinping. Their children are not here only for graduate schools, but for colleges, high schools, etc. These are the critical time for one's views and values to be formed and changed. For Chinese, it is one thing that they argue with Americans on different values, it is another when they are arguing with their own children." Indeed, according to Open Doors report by Institute of International Education, China has been the largest source of international students to U.S. since 2008. School year 2015/16 alone observed over 328K Chinese international students in the U.S., with India in the second place trailing far behind with a total around 165K. A handful of government leaders' children getting American education perhaps won't signal much systematic change. North Korean's leader Kim Jong Un was Switzerland schooled and didn't turn out to be particularly friendly to the western world (or, to the world in general). However, such large number of American educated Chinese students will have an impact back in China. In addition, more return after graduation than ever. According to a report by the Center for China and Globalization, over 80% of overseas Chinese students returned after graduation. In 2016, returning overseas graduates outnumbered the total domestic graduates in China. More than anything, these numbers speak to the appeal of American education and the values it represents to Chinese. While economic and political tensions dominate discourse on China in American mainstream media, in reality, Huang's encouraging perspectives are perhaps precisely what's needed for those who want to bridge U.S. and China and get things done.